Note: This article is part of a series on international business due diligence. This article concentrates on Dubai. Doing business internationally comes with both advantages and risks. When you’re considering a business opportunity in Dubai, the largest and most populous city in the United Arab Emirates (UAE), minimize your risk by performing focused due diligence before you make costly business decisions. According to its site, UAE Free Zones is “an industry leader in business consultancy and company formation in the UAE for over a decade.” This site assists entrepreneurs who do not have the knowledge or resources or the experience to start their business in the UAE. Zawya provides business intelligence and a directory of companies in Dubai. DMCC is home to more than 15,000 businesses. That includes brokers, banks, commodities exchanges, business support firms and professional services companies. This directory can be used to search for international and local companies in cities such as Abu Dhabi, Dubai, Sharjah and Ras Al Khaimah. In Dubai, there are several telecommunication service providers (Etisalat is owned by the government). These telecommunications companies are also a useful way to investigate companies by confirming a business’s physical presence in Dubai. The court system for UAE comprises Sharia courts and civil courts. The Sharia courts have existed since the time of the Ottoman Empire when they functioned as the official court of the State. Federal Supreme Court (at the federal level) and the Court of Cassation at the local level of the emirates which have independent judicial departments. “If the ruling of the Court of First Instance is not satisfactory, it can be challenged before the Court of Appeal and then the Court of Cassation according to the provisions of Federal Law No. 11 of 1992, as amended by Law No. 10 of 2014 concerning the Civil Procedural Law”. The Dubai Chamber is an excellent way to determine the legitimacy of a company in Dubai. This website offers several directories, organized by category or first name. To determine and/or verify the patents owned by a company, the investigator would utilize the Patent Cooperation Treaty (PCT). It assists applicants in seeking patent protection internationally for their inventions, helps patent offices with their patent granting decisions, and facilitates public access to a wealth of technical information relating to those inventions. By filing one international patent application under the PCT, applicants can simultaneously seek protection for an invention in a very large number of countries. To determine and/or verify the intellectual property owned by the company, the investigator would utilize the World Intellectual Property Organization (WIPO). According to its website, the World Intellectual Property Organization is “the United Nations agency dedicated to the use of intellectual property (patents, copyright, trademarks, designs) as a means of stimulating innovation and creativity.” This agency promotes the development and use of the international intellectual property (IP) system through services, development, law and infrastructure. Is the Company on a Global Watch List? Dubai-based blog sites can provide valuable information to researchers. What’s On Dubai is a particularly useful source for business and cultural news. 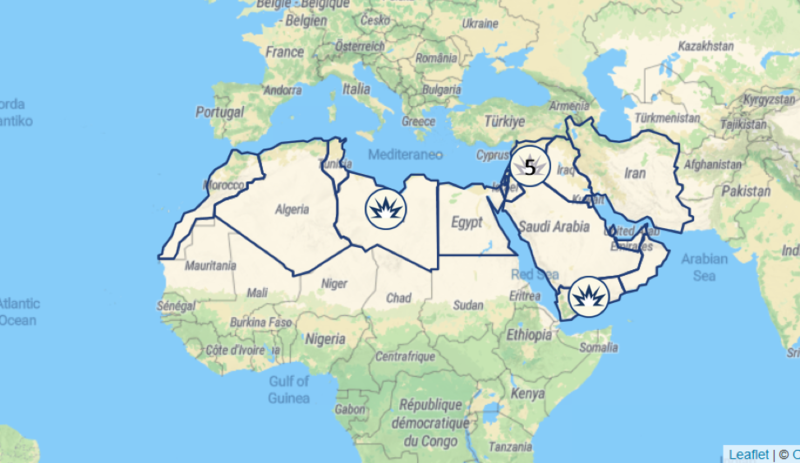 Published by the International Institute for Strategic Studies (IISS), the Armed Conflict Database provides information about armed conflicts around the world. You can generate reports, download data and browse year-by-year analyses and fact sheets to determine if there is armed conflict near the area where you want to locate your company. TRAC “provides accurate and in-depth information supplied by experts from across the globe. Master indices of known terrorist groups, affected or vulnerable regions, terrorist activities, and original articles are cross-referenced to an intuitive network of research.” Also, TRAC can identify cities vulnerable to terrorism. Map courtesy of ©OpenStreetMap contributors and Leaflet. If you want to do business abroad, doing due diligence beforehand can save you money. It is also a good method of evaluating the strengths and vulnerabilities of a potential business partner. Dr. Kim Miller is an adjunct professor of criminal justice in the School of Security and Global Studies at APU. Her academic credentials include a B.S. in Criminal Justice and an M.S. in Criminal Justice from Kaplan University, as well as a Ph.D. in Public Safety-Criminal Justice from Capella University. She is also a Certified Fraud Examiner, a New Jersey Licensed Private Detective, a Certified Paralegal and an investigative analyst.